I see a bad moon rising, but that's mostly because I'm up at 2 AM writing this. Welcome to round ten of battle of the covers, and after two straight post-2000 songs we're returning to the classics with a little Creedence Clearwater Revival. Round 9 was another hard fought battle, with Ray LaMontagne and the Violent Femmes battling for the lead, and battling for attention with the debut of the new Miata. A late surge propelled the Violent Femmes to victory, beating Ray by three votes. The Femmes had a chance at the double win, going into the final hour of the "worst" battle as part of a three-way tie. A last second vote for G4 stole the double away from the Femmes, giving the victory to the more "orchestral" performance. As we've established, hit songs tend to have interesting origins, and while this one's is more straightforward it's no less odd. The lyrics came to lead singer John Fogarty after watching the classic 1941 fantasy film The Devil and Daniel Webster. A particular scene involving a hurricane struck Fogarty's fancy, and he subsequently wrote the song, which is about about, and I quote, "The apocalypse that was going to be visited upon us. There may not have been an apocalypse but there was a hit. "Bad Moon Rising" peaked at #2 on the Billboard Hot 100 chart, #1 on the U.K. singles chart, and became a gold-selling album for the band. LEST YE FORGET! If you want to check back on the results of previous rounds, or see what covers are coming in future rounds, there is now a Google Drive spreadsheet with past rounds and the upcoming battle schedule. AND THE BONUS GAME! 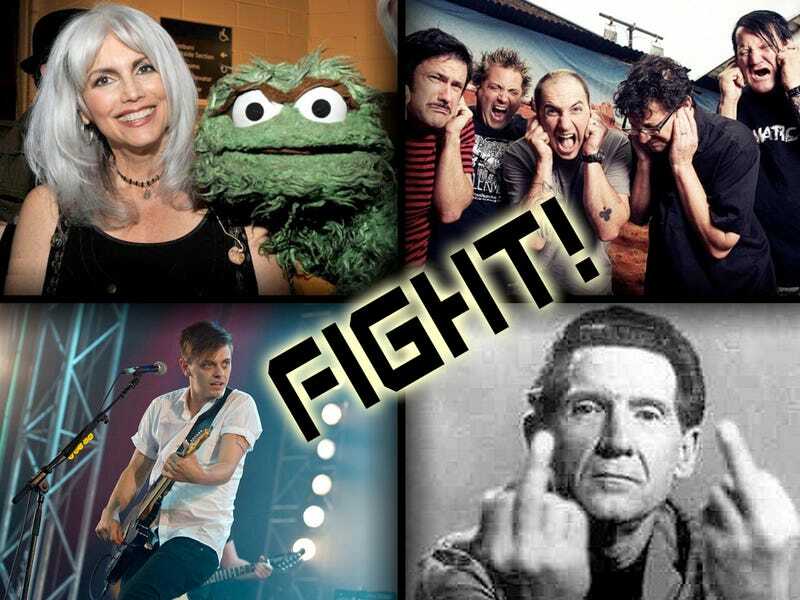 IDENTIFY THE FOUR ARTISTS IN THE "FIGHT" IMAGE AT THE TOP OF THE PAGE! BONUS POINTS IF YOU CAN DO IT WITHOUT THE GOOGLES!